Mama Brown's Pop-up Experience, a combination of pop-up shops, cafes and more, returns to 232 King's Road on Tuesday 25th November for a run until 10th December. Go to shop, to eat, to drink, and get Christmassy! 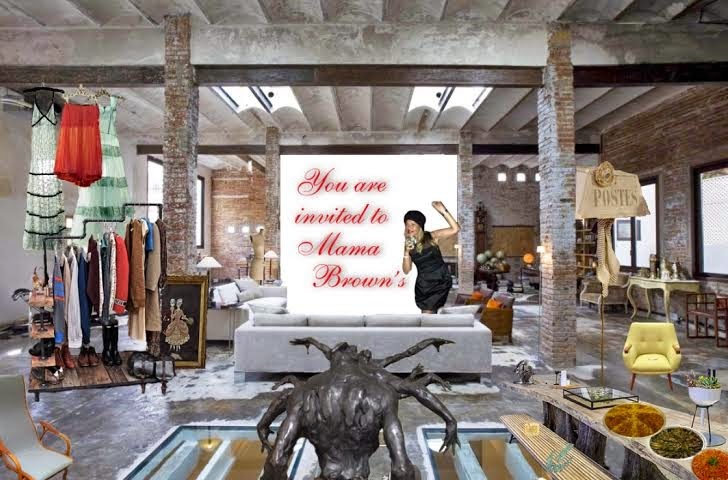 "London’s largest ever pop-up shop, Mama Brown’s Pop-Up Experience is back, bigger and better. Reconfiguring the cavernous and gritty space of the old Victorian postal sorting warehouse on Chelea’s King’s Road, the just-in-time-for-Christmas shopping extravaganza will transport shoppers to the eclectic and fashionable world of Suzi Almulla Brown, a.k.a. Mama Brown. Snaking through the corridors of the fully transformed warehouse space, the ultra-modern upscale meets industrial vibe will see a custom-built bar take residence as the pop-up’s focal point. Dueling extra-long communal tables will branch out from the bar and also serve as catwalks for regular runway presentations. As the main room’s centerpiece, the bar and communal tables will be surrounded by the best of drinks, food, fashion, art, furniture and sculpture – all available for purchase. Drinks-wise, S2 Drinks Ltd will be stocking the alcohol to include Imperial Collection Vodka, Grand Brulot Cognac Coffee and champagne. Mama Brown will be collaborating with a special guest - her actual sister, Samar Al-Bunnia, a.k.a. Sista Brown from the 25th of November through to the 2nd of December. An extension of the Mama Brown global brand, the best of Beirut is coming to London via Sista Brown - the food and the designs, be them fashion, furniture or art are all fresh and painstakingly selected. Sista Brown only deals with the real thing and guarantees that whatever you see will be innovative and not one bit mainstream. Guests can also cosy up on the sofas in the Mama Brown’s Shisha Lounge, sip a glass of mint tea or two and indulge their senses in the perfectly curated blend of art, rails and rails of fashion, beautiful merchandise and heaps of delicious food, all to the backdrop of the pop-up’s house DJs. Strategically designed to capture the Christmas retail period, Mama Brown’s edgy living room-esque emporium is as always a perfect blend of East London meets New York creativity, Middle Eastern chic, and West London exclusivity."